An unused shed can seem like a waste of space, or even an active annoyance to be maneuvered around when you’re doing yard work. Sheds are ubiquitous, but we seldom stop to think about the potential that an empty shed has. If it isn’t being used for its primary purpose as a safe, outdoor storage space, an empty shed is effectively 120 feet of enclosed, weatherproof space that you can do virtually anything with. The possibilities are endless, and the following list of seven ideas is just a tiny selection of options to take your unused shed and turn it into a valuable, unique addition to your property. You might even be tempted to obtain a quote from shedquotes.com.au/sheds-Sunshine-Coast/, if you don’t own one already! Urban and suburban microfarming is taking off, and your shed could be the key to having delicious, nutritious produce straight out of the soil year-round. The process of converting your old shed into a productive greenhouse is relatively simple and inexpensive. With a few fiberglass panels, common handheld power tools and some basic mechanical aptitude, you’ll have a small but functional greenhouse in no time at all. Slightly more forgiving than traditional gardening (since you control the environment) a small personal greenhouse is great for growing peppers, tomatoes, cucumbers, herbs, and many other plants, and can grow more than enough food to keep a small family in produce all year long! Most every child dreams of having a tree house, and a private playhouse can be the next best thing without the risk, expense, or expertise required when building and maintaining an elevated structure. A good cleaning and a fresh coat of colorful paint can turn even the most dilapidated shed into a child’s paradise! Inexpensive foam flooring and other child-safe materials will make it comfortable and safe, and you can even involve your little ones in the process. Let them fingerpaint on the walls, pick the loudest colors, and make the space their own! As an exterior, semi-temporary structure, a converted shed is the perfect place to let kids be kids without worrying about noise, mess, or damage to your home. Whether your interest is painting, pottery, or other art form, a converted garden shed can make an excellent and compact art studio. Private and isolated from the noise and activity of a busy home, you can concentrate on creating your art and not on the loud football game or TV program that your loved one is watching in the other room. 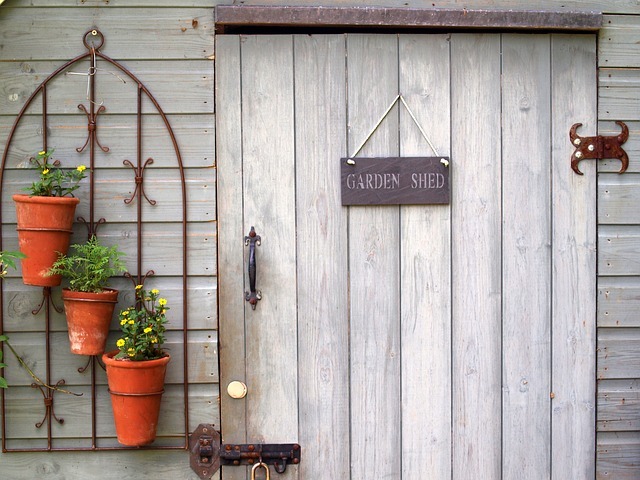 A locked shed is also an excellent way to keep curious children or oblivious visitors from intruding on your creative space, moving materials, or damaging fragile pieces. As an entirely separate building, the line between your private space and the communal living space of your home is clear and delineated, and there’s no possibility of a curious family member rearranging your carefully sorted tools and materials because they were “just looking for something”. The isolation and quiet of an outdoor structure make it ideal for producing music, podcasts, livestreams, or YouTube videos. With the recent rise of small content producers, reasonably priced equipment is now easier to find than ever. Whether you’re mixing a new song or recording a podcast on the history of your favorite sports team, an unused shed is a convenient area that can be converted into a miniature production studio relatively easily. All you need is a laptop, a microphone and/or webcam, and a chair to sit in, and you’re good to go! For an added touch of professionalism and quality, temporary acoustic paneling can dampen what little intrusive sound remains, and can be installed or removed in minutes with basic hand tools. While this one’s a bit more involved than the others (requiring insulation and wiring of the structure, as well as the installation of internet, etc.) the results can be more than worth it! Repurposed sheds make excellent home offices for the same reasons that they make excellent art and music studios: privacy, quiet, and isolation. A well-constructed home office offers all the comforts of home with none of the distractions. What’s more, an office close to but physically apart from your home can encourage a healthier work/life balance, because the externality and separation from your living area offers a clear delineation between your workspace and living space. An office shed gives you the convenience and ease of working from home without actually having to bring work into your home. It’s the best of both worlds! If you’re a competitive athlete or even just a fitness buff, an unused shed takes barely any effort to transform into a robust and versatile home gym. The addition of a mirror, weight bench, or conditioning machine is all you need, but if you want to further flesh it out, the sky is the limit! A sound system to blast your workout playlist as loud as you want, or a whole entertainment center to play your favorite TV and films while you run are two great options, as is a mini-fridge for cold drinks, or a small air conditioning unit or space heater to keep your gym comfortable no matter the weather. Filtering out distractions can really take your workout to the next level, and public gyms can be awkward and not perfectly suited to your goals. A home gym is a great solution that you can customize to your liking, and use however you want! We all need to get away sometimes. Converting your shed into a cozy nook where you can read, listen to music, or just relax is one of the simplest things you can do. The addition of a little paint, a comfy chair, a bookshelf, soothing décor and heating or cooling can give you a comfy, quiet place to take a load off and perform some much needed self care!